Do your research, take paddling at night seriously, and we think you'll agree... there is simply no better engineered or safer light for SUP paddlers after dark. The Kayalite-SUP® is a portable, submersible, high-visibility LED 360° light designed for rapid, secure attachment to stand-up paddleboards. Unlike lights depending on loss-prone suction cups, magnets or rigid mounts, the Kayalite-SUP is virtually loss-proof and indestructable, capable of taking a direct impact, paddle smack or accidental rollover in shallow surf. A tension cable holds the mast upright while preventing it from snapping or accidentally detaching. The Kayalite-SUP quickly fastens to a leash plug, FCS fin plug, D-Ring, or any existing eyelet on deck. To secure, you simply pull the tension cord taut with a single hand and cinch it on the Kayalite-SUP's built-in jam cleat. In a pinch, the Kayalite-SUP's universal clip can even be fastened to a taut bungee or deck rigging. Made in the USA of high-strength ABS, Lexan, rubber o-rings, marine-grade stainless steel fittings. Buoyant, waterproof, submersible to 1000' (300m) below sea level. Meets U.S. Coast Guard Rule 25 regulations for SUP, kayak, SOT, surfski, canoe, scull and vessels under oars. Provides 100+ hours of use on 3 AA batteries (included), LED life 10,000 hours. Stands 18 inches tall (45 cm) and weighs approx 13 oz. Kayalite Extension Kit: The Kayalite Extension Kit enables the Kayalite owner to disassemble and reassemble the Kayalite to 21" (53 cm) or 28" (71 cm). For more information on the Kayalite Extension Kit click here to open a new window. Kayalite-SUP Lens Option: Choose between one of our two Kayalite lenses: A) our classic Kayalite clear lens with a white 360-degree reflector or B) our white, titanium-infused "diffusion lens." The clear lens offers high-visibility all-around with the added ability of the Kayalite to be aimed in a particular direction to direct a narrow beam. The newer "diffusion lens" (our standard part, recommended) captures and redirects light normally aimed skyward to improve visibility at 360 degrees across the watersheet while protecting the paddler's night vision. Lenses are interchangeable and can be ordered separately. Kayalite-SUP and R25™ Electric Torch Pro Combo Offer: Buy a Kayalite-SUP today and add a Kayalu R25 360° Electric Torch for only $15.00! 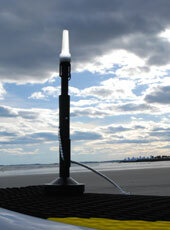 The R25 is the perfect hand-held light for signaling visibility to other vessels sharing the watersheet. Waterproof and submersible to 1000 feet (300 m). For more information on the Kayalu R25 Electric Torch click here to open a new window. For more information, click here to visit this product's webpage in new window.